Thank you for your question. Our compatible cartridges are made to perform to the same level of quality as the genuine cartridges. If you encounter any issues whilst using our products we have a range of troubleshooting steps that you can try out. Hi, I'm looking for a drum for a Brother HL3140CW printer. Do you supply them and how much are they including shipping? I live in Ireland. Thank you , Finbarr. The software that came with the Brother HL3140CW printer lets me know how much toner is left \x96 will this feature still work using compatibles? The compatible Brother Hl-3140CW toner cartridges should report the toner levels in the same way although it's sometimes the case that when using compatibles, the toner life isn't always reported accurately. However, this won't affect your ability to use all of the toner in the compatible HL-3140CW cartridges. Hi, I keep having 'optical photoconductor' coming up as needs replacing in my Brother HL-3140CW laser printer. Please advise me with a link to buy the correct product? I'm also getting a message about the drum but not sure if this is the same thing? Thanking you in advance, Mel. Will the HL3140CW A4 laser printer print envelopes? If I nearly always print in black, can I just renew the black cartridge and not have to renew colour ones at the same time? Provided that all four of the black, cyan, magenta and yellow cartridges are present within your Brother HL-3140CW printer and have at least some remaining toner, you should only need to replace the cartridge which runs out. Therefore, if you use up your black Brother HL-3140CW toner you can leave the colour cartridges installed and should only need to replace the black toner regularly. What is the capacity of the Brother HL-3140CW toner cartridges i.e. how many A4 sheets can I print before these toners need replacing? Why don't you bundle high capacity toner cartridges together for the Brother HL3140CW? The Brother HL-3140CW printer doesn't use a high capacity black toner so the 4 colour Brother TN-241 toner pack we currently stock only contains standard capacity toners. A small office that needs a reliable and fast digital colour printer will find that the Brother HL-3140CW wireless colour laser printer is suitable. With wireless capabilities, it simplifies and speeds up connectivity needs for direct printing from mobile devices. The Brother HL-3140CW colour printer performs admirably on paper handling and speed, but it lacks some useful features that could affect productivity and its overall convenience. This compact cube-shaped LED technology printer measures 16.1 inches wide, 9.4 inches tall, and 18.3 inches deep, and the Brother HL3140CW colour laser printer has a 250-sheet standard input capacity with a single-sheet manual bypass slot. High-speed USB 2.0 and Wi-Fi are the standard interfaces of the Brother HL-314C0W digital colour printer with wireless networking, and it runs on 64MB of memory. This machine can use high capacity Brother HL-3140CW colour toner cartridges. 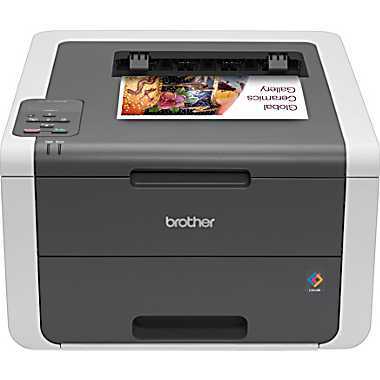 The Brother HL-3140CW printer is fast and the Wi-Fi connectivity speeds up connectivity with tablets and smart phones. It supports Google Cloud Print and AirPrint, yet it is versatile enough to be connected directly to a computer via a USB connection. The print speeds are up to 19ppm in monochrome and colour. It is compact, so it can fit on cramped spaces and tables. The print resolution of the compact Brother HL3140CW colour printer is up to 2400x600dpi, and it supports recycled paper. Printing costs can be reduced by using the secure function lock, which controls colour printing among users. Photo and text quality is not that good. The HL-3140CW laser printer lacks Ethernet connectivity and two-sided printing capabilities. The memory is not expandable. It can be difficult to set up the Brother HL-3140CW wireless colour printer because it weighs 17Kg. There is no display screen.